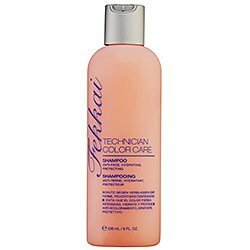 What it is:An ultra-moisturizing shampoo for damaged or color-treated hair.What it does:This shampoo is formulated to restore health to the hair by replenishing moisture, while strengthening and protecting each strand. Natural cleansers gently purify the hair and natural conditioners add moisture. Apricot, avocado, calendula, and peach provide extra moisture and softness for the ultimate hydration. Damaged hair will be softer, smoother, and shinier. Miraculous Results - The Holy Grail of Hair Products! I am prematurely gray (98%)and have been coloring my hair for years. My hair was dry and not great in the first place, but has since suffered terribly in the fight against the gray. My hair is long (past my shoulderblades) very thick but flyaway, feels like straw, and is always, ALWAYS frizzy. The most expensive frizz serums only give me oily frizz. I have taken to wearing wigs because my hair is so dull, dry, and frizzy I can do nothing with it but put it in a ponytail, and I am embarrassed. Over the years,I have spent hundreds of dollars on beautician-recommended conditioners, masques, deep treatments, you name it, only to have NO improvement. FYI Last week I tried the sample sizes of the Fekkai Moisturizing shampoo, conditioner, and masque with the Shea butter line, but was bitterly disappointed - my hair was softer but I still had frizz, flyaways, and crunch. Maybe the Shea butter line works very well if your hair is not chemically processed - I don't know. However, when I saw the reviews for the Technician line, I decided to be a sucker and try again. It was the BEST hair decision I have ever made. If your hair is overprocessed, go straight for the Technician line of products - they are well worth it. I purchased sample sized bottles of what I thought were the Technician shampoo and conditioner. When I got home, to my disappointment, I saw I had purchased two bottles of the conditioner only! Nonetheless, I jumped in the shower and tried this conditioner after using my usual shampoo. The first thing I noticed was how a little of this stuff went a long way. Usually I have to use gobs of conditioner. But a half dollar sized dollop of this stuff was perfect for my long, overly thick hair. I got a wide toothed comb through it with no trouble - a first! Next I noticed how smooth and silky my hair still felt when I was almost done rinsing the conditioner out. Normally my hair feels pretty rough to the touch during that stage of the process. I let my hair partially air dry and noticed it felt softer than it usually does, which to me didn't prove much. I was still skeptical until I blow dried it. When I was done, I was shocked and surprised at how much like "normal hair" mine looked and felt like, and it smells terrific. Currently it is August and we have been experiencing extremely high humidity. Over the past two days since I washed it, my hair has not puffed out like a dandelion - no crunch and no frizz at all! I am going back to get the shampoo and conditioning masque as well and am looking forward to seeing the results. I also used the glossing spray and I finally have a little bit of shine, not the oily frizz! If the Technician line worked for me after all these years of trial and error, I would say it would work for anyone. I feel like I have found the Holy Grail of hair care for me - Frederick Fekkai now has me as a customer for life! All days are good hair days! Can't stop touching my hair! This particular shampoo and conditioner are, in all honesty, the best shampoo and conditioner I've ever used. From the first time I used them on my chemically-treated, split-end infested hair, I could not stop touching it! It was softer, smoother, and shinier then it had been in a long time! Even more notable, my husband, who doesn't notice anything of this caliber until it smacks him upside the head, said "Wow, your hair looks great!" TWICE! BEFORE I even said anything to him! The shampoo also has a decent lather, unlike most pricey ones, and the conditioner has good coverage. A little goes a long way. Also, what's important to me is that this shampoo and conditioner SMELLS GOOD, which is a big deal considering that most in this price range and above, especially restorative ones, smell like puke! The best shampoo I've tried! 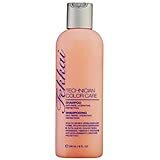 I've used a LOT of different shampoos in the past, and I was never quite happy with any of them. I have coarse, highlighted hair, and I hated how typical color-treated shampoos didn't clean very well, or cleaned so well that they stripped out the color. Great Product! Will be a Repeat Customer! Based on the reviews, when I finished my last container of Aveda shampoo and conditioner I bought this. For background, I am 30, get my hair highlighted every four weeks with touch ups in between, and use a straightening iron or curling iron every day - in other words, my hair takes a beating, and I am vigilant about conditioning it. And this shampoo and conditioner really are fine - they do what they promise, my hair is manageable and hydrated, it is, all around, a high quality shampoo.